My work ranges from impressionism to abstraction. It is always full of design, color and pattern. Many of my paintings begin with black ink line using a technique called "Blind Contour Drawing". In this technique, you look only at the objects as you draw, not at the paper, letting your eye move along shapes and edges in the objects, letting your hand follow your eye as you draw. This technique often creates whimsical shapes. 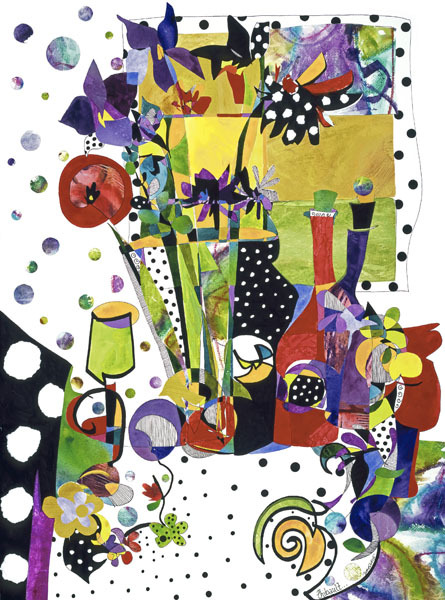 Working very spontaneously, to these shapes I add fresh, bold color, pattern and texture using watercolor and acrylic paints, and then apply hand-painted collage papers for additional pattern and color. As a result of this process, many people describe my work as having great black and white graphics with color and design that sizzles! A few years ago, with the help of the staff at Sarnoff's Art & Writing in Tucson, AZ I've developed a new process that allows me to frame my canvas and paper-based work without glass or plastic glazing. This process essentially seals each layer of my work — painting, mat and backing — with several layers of clear acrylic gel medium. When dry, these layers are assembled into a "sandwich" using a heat mounting process. This unique, new process permanently fuses together the art, the backing, the mat, and a transparent, protective, and non-reflective finish. Paper-based works can then be immediately framed without glazing, while gallery-wrapped canvas works emerge ready to hang. Please inquire about buying a GICLEE (hover for definition) for most of the art you see on the web site. Just tell me about what size you want, and it can be custom made for you.